Talking about cancer is never fun, but we’re trying to make it easier. The Irish Cancer Society’s upcoming Colour Dash will try to bring some colour and vibrancy to the cancer cause, writes helpline nurse Naomi Fitzgibbon. Nurse from the Irish Cancer Society’s National Cancer Helpline and Manager of the Cancer Information Service, Naomi Fitzgibbon, talks about how she plans to show her Cancer Fighting Colours and do the Colour Dash, the Society’s new colourful 5k, sponsored by Crown Paints, taking place in Phoenix Park on July 27th. TALKING ABOUT CANCER is never fun. For most people it is a very dark time and, though they may ultimately come out the other side a stronger person, it is still a subject that can be cloaked in darkness. So much of our work is about trying to make talking about cancer easier – to try to lighten the shade of those conversations. Even fundraising for cancer or celebrating surviving cancer can still be under a grey cloud. The Colour Dash brings some colour and vibrancy to the cancer cause, giving people a fun, light and colourful way to support cancer. I think that’s why we have had such a great response from the public and the event has sold out. All the money raised will help support people with cancer through services like the Helpline and we hope that the event will encourage people to talk more openly about their cancer experience. We get queries from people in many different situations with different types of cancer. Our most frequent queries are around the most common cancers prostate, breast, bowel and lung cancers. Most people just call for advice and support – their diagnosis plunges them into a world they never knew before, a world with a new language full of strange terms and complicated names. Often they will speak to us and ask about things their doctor said. A doctor’s office can be an intense situation – many patients have so many questions but they can’t remember them during that appointment and afterwards, when back at home, their mind can be swimming with questions and confusion. That’s when they contact us – there’s no pressure – it’s all in their own time and we can help make sense of what their doctor or nurse has said. We give them the time and space to ask all their questions in confidence and give them the added support they need at any stage of their cancer journey. Others call with a specific problem – a bad reaction or side effect from their treatment that they want our help with. Recently a man called, confused about his treatment options and unsure of what path to choose. We were able to take him through everything slowly – he called back several times and really went through every question he had. During these conversations we were able to not only talk through his treatment options but also tell him about the different elements of support available to him – including what financial assistance was available to him and how he could be connected with a man who had undergone similar treatment. The man called back later to say how much we helped put his mind at ease and empower him to make the best decision for him. It is hugely satisfying to be able to help someone when they need it. Unfortunately Ireland’s cancer incidence is among the highest in the world. One in three people will develop cancer during their lifetime and everyone is deeply affected in one way or other. There are always more people to support – our helpline answered almost 30,000 enquires last year by phone and also on social media. We want to be able to support even more calls and enquiries next year. 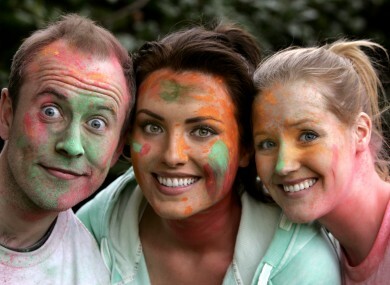 The Irish Cancer Society’s Colour Dash, the only powder paint run giving 100% of money raised to charity. Proudly sponsored by Crown Paints. Kindly supported by Spin 103.8. Do the Dash, get splashed, and raise some cash! Email “Column: Cancer is a subject still cloaked in darkness – we're trying to lighten the conversation”. Feedback on “Column: Cancer is a subject still cloaked in darkness – we're trying to lighten the conversation”.